This show has a Tin Man, a Scarecrow and a Cowardly Lion. It has a flying Wicked Witch who is – no doubt about it – 100 percent evil. It is, in no way, a prequel, a sequel, a retelling or a reimagining. 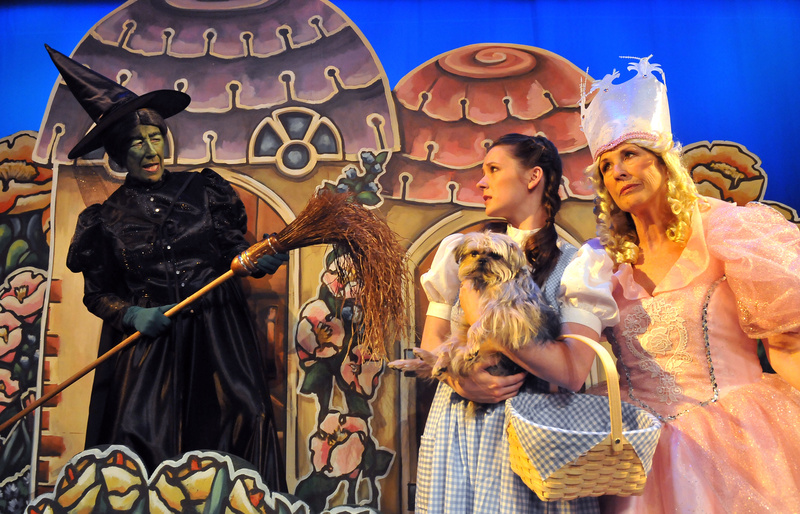 In other words, the Coeur d’Alene Summer Theatre’s “The Wizard of Oz” is a faithful stage version of the classic 1939 MGM movie, from its head all the way down to its Toto(s). It has all of the charms and even most of the dialogue of the movie. And that came as a pleasant surprise to Margaret Travolta, who plays both Glinda (the Good Witch) and Auntie Em. “The lines came very easily to me, because I’ve heard those lines in my head, all of my life,” said Travolta, who has lived in Coeur d’Alene for the past two years. She’ll be floating onto the stage in a bubble and dispensing various bits of magic. She said that’s just as much fun as it sounds. “I like waving a wand and making things disappear,” said Travolta. This will be her second show at the Coeur d’Alene Summer Theatre, after last summer’s “Cinderella,” which broke the theater’s box office records. Once again, she’ll be joined by older sister Ellen Travolta, who plays Glinda’s polar opposite: the Wicked Witch of the West. “The Wicked Witch is a natural for me,” said Ellen, barely suppressing a cackle. Those who saw the Broadway touring show “Wicked” should not expect this Wicked Witch to be sensitive and misunderstood. And she’s a particularly lofty version of evil. The Wicked Witch spends a lot of time flying above the stage, courtesy of the experts at Flying by Foy. She promised a lot of special-effects magic. The cast includes one other Travolta-related member: Jack Bannon, husband of Ellen, who will play the Wizard and Professor Marvel. Roger Welch, the theater’s artistic director, will don a different mantle for this show. He’ll play the Cowardly Lion/Zeke. CdA Summer Theatre veterans will also play the other showcase roles: Christopher Moll as the Tin Man/Hickory and Cameron Lewis as the Scarecrow/Hunk. Patrick Treadway will play Uncle Henry/Green Guard. This version will have no shortage of Munchkins. They will be played by 28 local children.